A series of charity events will take place in the coming days in France and several Eurovision representatives are involved in them. From the release of a song to raise money for children to performances at the Olympia Music Hall in Paris for the fight against cancer. Today the videoclip of the song Je Reprends Ma Route (I Resume My Journey) was released. It sees all the artists involved in this project while they were recording their voices for this charity project. Among them there are some Eurovision former representatives such as Hugues Aufray (Luxembourg 1964), Marie Myriam (France 1977), Gérard Lenorman (France 1988) and Anggun (France 2012). They all answered to the call launched by the association La Voix de l’Enfant (Voice of Children) and they met in the studio to record the single. The video is quite simple as the artists were filmed in the studio during the recording of their verse and these images are interspersed with footage of different paths and landscapes around the world. This single which will be available in digital stores from the 24th of September is the first one from a compilation which will be released on November 19th. It will be a double album produced by the crowdfunding platform My Major Company and everybody can participate in the production of the album with their donations. All users who invest will recover all of their donations if more of 50,000 copies of the album are sold. To motivate the support for this project, My Major Company and La Voix de l’Enfant offer a range of exclusive and original counterparties for the investors, who will receive a copy of the single in physical format and an exclusive poster with the pictures of the artists who participated in this project. Also, in the case of the album achieves the gold certification every donor would be rewarded with a personalized copy of this award. 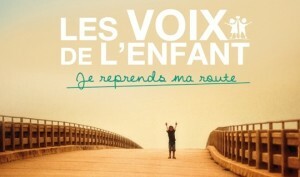 According to an official statement, the purpose of this compilation is twofold: on the one hand it is to generate income for the association La Voix De l’Enfant and all the benefits to be derived from the sales will support this charity which was founded to listen to and protect all children in need, whoever or wherever they may be. On the other hand, all this promotion will provide greater visibility of the association and its missions around the world. Besides this, tomorrow, the prestigious Olympia Music Hall from Paris will be the venue for a concert called Leurs Voix Pour l’Espoir (Voice For Hope) to raise funds for the Digestive Cancer Research Association. Among the artists on stage there will be a couple of French representatives such as Natasha St-Pier (2001) and Amaury Vassili (2001) and also the 1969 Dutch national final entrant Dave, who is a very well-known artist in France. Another charity event will take place also at the Olympia Music Hall on the 24th of September to celebrate the 10th anniversary of the Laurette Fugain Organization for the fight against Leukemia. Singers, musicians, actors, comedians, dancers and acrobats will offer one single representation of the show Départ Immédiat! and the French representative at the 2012 Eurovision Song Contest, Anggun, will be part of the cast. Below you can watch the new videoclip of Je Reprends Ma Route. Recently a charity project in Denmark kicked off with the support of several national finalists and also the past two Danish Eurovision Song Contest participants; Soluna Samay and A Friend In London. You can read more about that in our previous article.